A customer that has bought this device years ago somehow managed to fry this IC and he tried to replace it himself. That did not work out though and he messed up the track for good. He sent it to us to repair it. My boss gave me this board and told me to fix it. We do not have a replacement board, so I have to somehow fix it. Question is how do I solder this? Edit: I looked up where the broken trace leads to in the schematics and then got into contact with the customer. As it turns out, it leads to a part of the device he never used and he's not planning to use it in the future. So he gave me his Ok to leave that pad unconnected. The other pads - believe it or not - actually had a strong enough mechanical bond for the application (a large gas analyzer that is only rarely moved). I would've definitely used the suggestion from Marcus Mueller if the trace in question would've been needed, so a shoutout to his answer as well. It all depends how important this customer is to you. This is a fix that can only be done in a very messy way, as in it won't look very professional. Find out how important it is to have this fixed, tell the customer that if it was fixed, the damage is great enough that reliability will suffer because of it, and your company cannot offer a guarantee etc so you cover your own backs. If they insist they want it fixed, then go for it. I will tell you a way I have personally used which is the tidyest way I have found, but it is not the easiest. You will need a thin piece of wire, one that can go through the via that the track is connected to, and also sit under the IC without lifting it anywhere. Thread the wire through the via and solder it on the underside. Run the wire out to where the original pad was. Now place the IC on the pads and carefully lift the leg of the IC with tweezers. The rest of the IC should sit flush, allowing you to solder the legs to hold it in place. Once you have made sure that the other legs are soldered, and your bit of wire is not shorted to any other legs, cut the wire to length, and solder it to the IC pin. You can either leave it like that, or carefully bend the pin back down so it looks flush. This should give a good solid connection, but remember that depending on what the IC does, and what that track is for, it may no longer perform to the standards it was specified to. You can definitely repair this pad. There are special kits available that allow you to bond a new pad and connect it to the trace. If you are a skilled solderer then it shouldn't be too hard for you to do. I have used these kits in the past and they work well. As long as the pad connects to the trace on the surface of the board (as opposed to a also broken via on an internal layer), then it is doable. Search for "land repair kit" or "lifted pad repair kit" and you'll find plenty of options. The following is really the way to go if your repaired board needs to be as reliable as the original, and your customer's going to pay for it. If one of these two requirements aren't met: Fly a wire for the broken connection, and solder your replacement IC to the intact ones. You'll have to make an adapter board, because lifted traces are virtually unfixable. Cover adjacent components on the original PCB with Kapton tape. Use a hot air gun and carefulness to remove excess solder from all the pads and vias that you'll have to connect your adapter to. Keep the tape in place. You should probably in the same step fill the empty vias that you will need to solder to later on with solder to avoid them sucking the solder away from the contact. So, get your favourite schematic editor, and place the IC. Make a modified footprint/component that has the same contact postions (but smaller) where there are undamaged pads on the original PCB, and a round pad for the next connecting via where there is a damaged pad. Mirror that footprint, and put it on the bottom side of your adapter PCB design, the original IC footprint on top. Connect using vias as necessary. It might make sense to make the adapter PCB a little larger (potentially not even rectangular, seeing that space is tight) than minimally necessary, and to place decoupling capacitors close to the IC on the topside. Don't forget to a add a ground plane on both sides of the PCB. Extensively use ground plane via stitching. You'll need that for heat transfer during soldering the adapter on. Print out the PCB design in real size, cut it out and verify it'll fit on the board, and actually hit all the right places. Get that adapter PCB made, if possible, on thinner than-standard PCB substrate (oshpark has a very cheap and for your trace sizes sufficiently accurate 0.8mm PCB service). Order a SMD stencil for the adapter board. Cut it so that it fits on the original board. Tape it in there. Use the stencil to apply solder paste to the original board. Carefully remove the tape that holds the stencil in place and lift of the stencil. Drop the adapter PCB into place. Solder on using hot air (if possible, alternately heat from both sides). (that's why you taped the other components down, so that they don't get blown away). Solder IC on top of adapter PCB as usual (for this specific footprint, you might not even need a stencil – a fine line of solder paste from a syringe across the pads might be sufficient). Option 1) Bridge the gap by either bending the pin under the part, or with wire. If you try and solder this with wire directly to the bare copper next to the pin it will be difficult because as soon as you touch the soldering iron to the pin, because of the short distance, the entire wire will become unsoldered an may move. Since it's underneath the part this will create difficulties. Not the easiest option, but more robust (because you'll have to bend the all leads up on the new part to raise it above the board to create space for the wire) (I guess both options will have a height constraint. Get blue wire (Kynar 30ga) solder it to the via. You may need to strip some of the insulation to reduce the height constraint underneath the part (no insulation under the part, but take care to not short anything). Try and keep the wire and soldering as low under the part as possible. Given the bent, broken, scratched and delaminated state of a lot of those pads and tracks I would not trust any of them. I bet a scalpel would readily lift some of those tracks and therefore the mechanical bond is no good. If anything moves after you put the part down and apply heat you could have a short that can never be fixed. If it's truly worth doing I would take a new breakout board for that footprint and take 30 gauge Kynar insulated wire to every pad that will be covered by the breakout board then mechanically fix it in place. Then connect the breakout board to the main board using wires as short as possible. That's a lot of tweezer work. 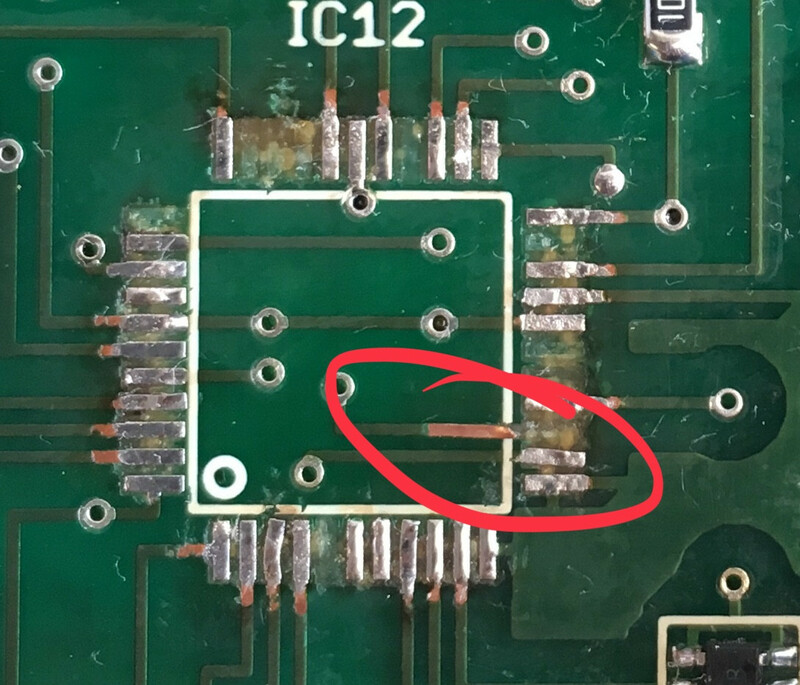 From the look of the board it isn't a place where length and layout of traces is vital (RF), as they have sharp corners etc - but something to be sure of before deciding a repair is viable. Not the answer you're looking for? Browse other questions tagged pcb soldering damage or ask your own question. How do I solder this USB Connector? How can I solder this circuit board without breaking it? How do I solder this red part in PCB? How to solder wires to this speaker?